BERKELEY, California, January 14, 2008 – The Jazzschool proudly announces the opening of Capturing The Moment – Jazz & Photography, a photography exhibit celebrating the rich Bay Area jazz scene by photographer James Knox. The exhibit will run from January 12th through March 29th, 2008, in The Bassment, the Jazzschool’s Books and Records store located at 2087 Addison Street in Berkeley California (downstairs in The Jazzschool.) The Bassment hours are Mon-Thurs 4:00-8:30 pm, Friday by appointment, Saturday 10:00-4:00 pm, and Sundays before, between sets, and after concerts. The phone number is 510-845-5373. James will discuss his passion for jazz and photography on Sunday, February 24th from 1:30-3:30 pm at The Jazzschool followed by Bay Area sax great Howard Wiley in a tribute concert to the music of sax legend Dexter Gordon at 4:30 pm. James Knox is music reviewer/photographer for www.j-notes.com. He has been photographing and reviewing the Bay Area jazz scene for over five years. 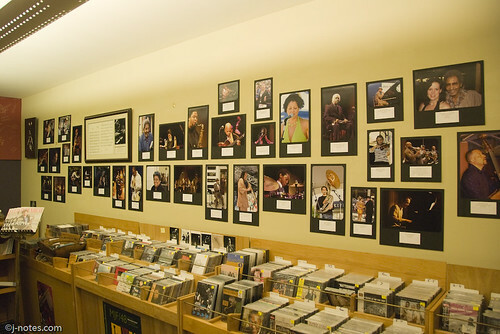 In summer 2007, James completed a jazz photography exhibit at the San Francisco Public Library African American Center. It received rave reviews. His work is featured on www.jazzreview.com, www.blogcritics.com, and www.sfgate.com. His photographs are featured on album covers for Clairdee and Adam Shulman, in addition to numerous artists’ websites. He recently provided a photo for the Wall Street Journal Weekend Edition. James credits his passion for jazz and photography to his father and dedicates the exhibit to his parents, Ritson and Elizabeth Knox. For more information, please visit www.jazzschool.com or www.j-notes.com. Where: The Bassment, the Jazzschool’s Books & Records Store, 2087 Addison Street , Berkeley , Ca. 94704 (downstairs in The Jazzschool.) The Bassment hours are Mon-Thurs 4:00-8:30 pm, Friday by appointment, Saturday 10:00-4:00 pm, and Sundays before, between sets, and after concerts. The phone number is 510-845-5373. This entry was posted on Tuesday, January 15th, 2008 at 11:27 pm. It is filed under Exhibits, Music News/Info, Photography. You can follow any responses to this entry through the RSS 2.0 feed.